According to experts at Human Rights Watch (HRW), Chinese authorities engage in a strategy of systematic militarization of Tibet. 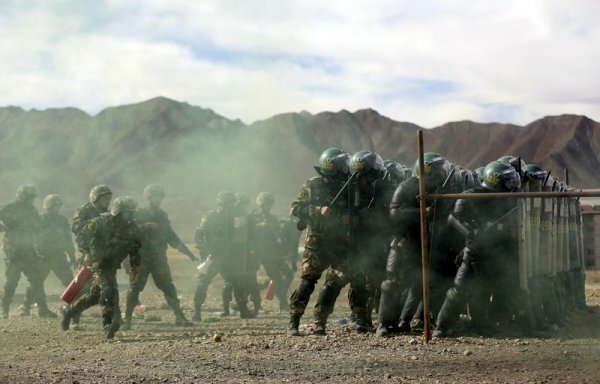 By organizing extensive military drills and, in general, showing an intimidating troop presence in the region, Beijing apparently attempts to intensify its crackdown on and intimidation of Tibetan civil society movements. HRW strongly condemns the Chinese government’s systematic and large-scale militarization of daily life in Tibet, coming to the conclusion that it will only exacerbate the situation and, potentially, lead to even more protests. Monks debating, breathtaking landscapes, the Potala Palace against a clear blue sky: these are images many around the world commonly associate with Tibet. Armed police, public security, border security, fire prevention, [and] special police forces…fully armed, bravely and fearlessly took up battle-ready formation in nearly one hundred vehicles, armored personnel carriers, and special military vehicles...the drill began and stability maintenance forces moved out in unison, to begin their patrolling preventive control duty. At other times this year, the official media has also broadcast “training exercises” by special police and paramilitary units, in which the targets appeared to be ordinary vehicles or private homes, and the “enemies” were civilians. China’s security forces, like security forces everywhere, are entitled to conduct training exercises wherever needed for genuine national security reasons. But these militarized displays of force and rhetoric do not appear intended to address a potential threat, but to send a message that lethal force will be the response to any form of protest or opposition. Massively exaggerating the threat the government faces can only add to Tibetans’ sense of alienation from the state, and increase popular discontent. China does face low-level popular dissent and protest in Tibet. But its use of public and mass intimidation is no way to address it.